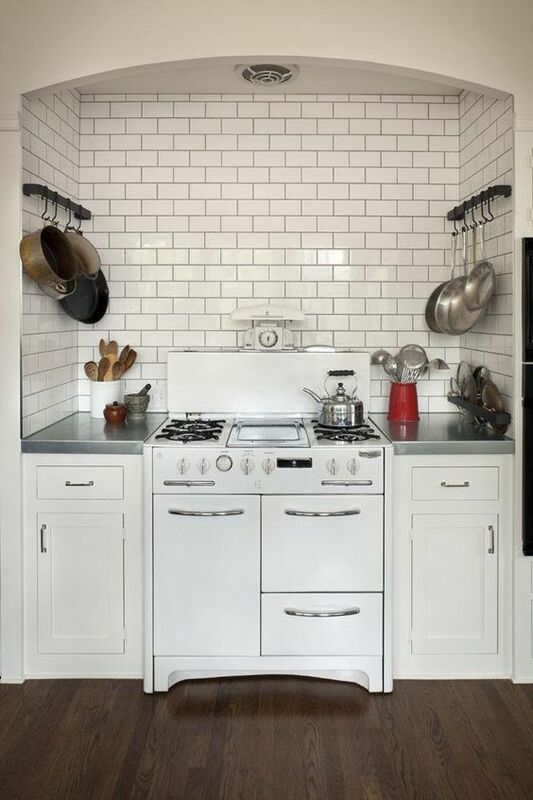 Lately, I've been obsessed with kitchen stove niches. 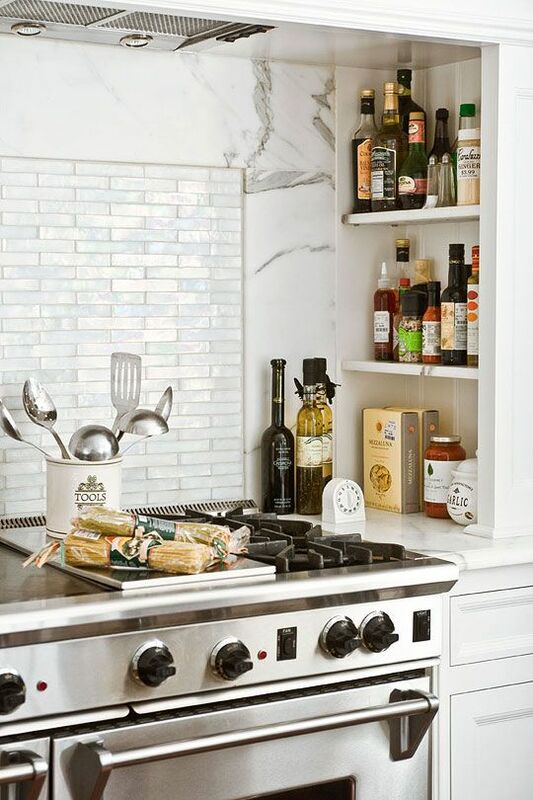 I love the idea of a stove tucked in its own space with shelves on either side for spices and cooking condiments. Niches also create a wonderful focal point in the kitchen, much like a fireplace does for the living room. I particularly love this example with its curved ceiling. How wonderful is that stove? 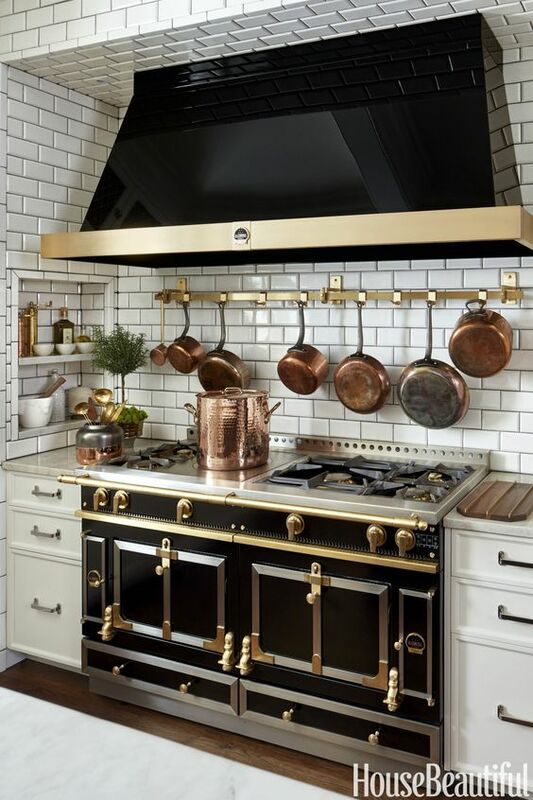 A stove like this deserves its own niche! Putting the pots on the backsplash brings all the cook's tools close at hand. I'm not a fan of the stove, although at one time I would have been. But I like the cookware hanging on either side. This niche combines a tile backsplash with soapstone which looks great with the black cabinetry. Copper cookware sits on the shelves. I absolutely love this design. 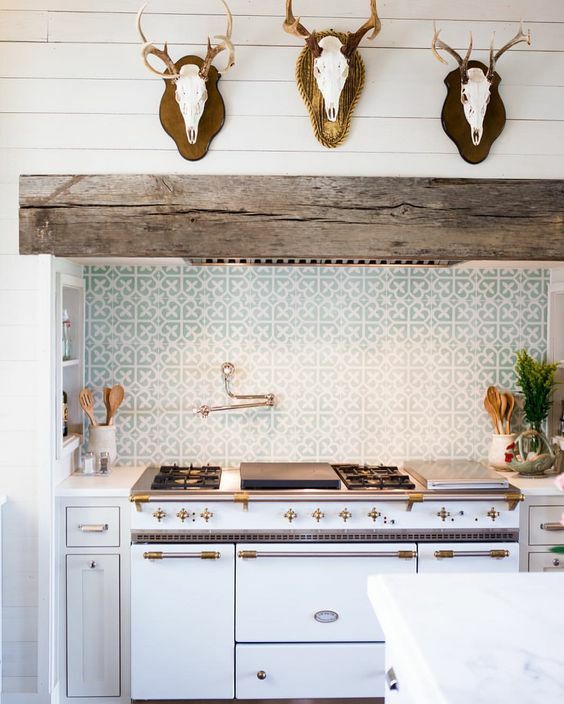 The rustic beam juxtaposed with the tile is unexpected and fun. I saved my favorite for last though! 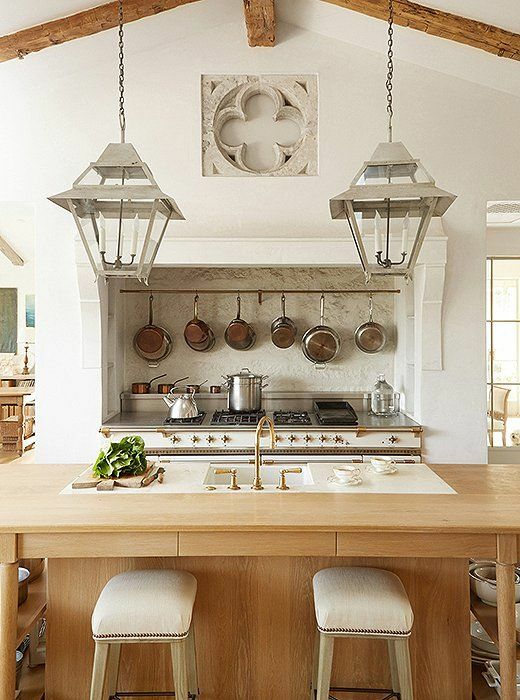 The kitchen in Steve and Brooke Giannetti's Ojai home is such an inspiration. It has all the elements I'm hoping to incorporate into my Asti kitchen. 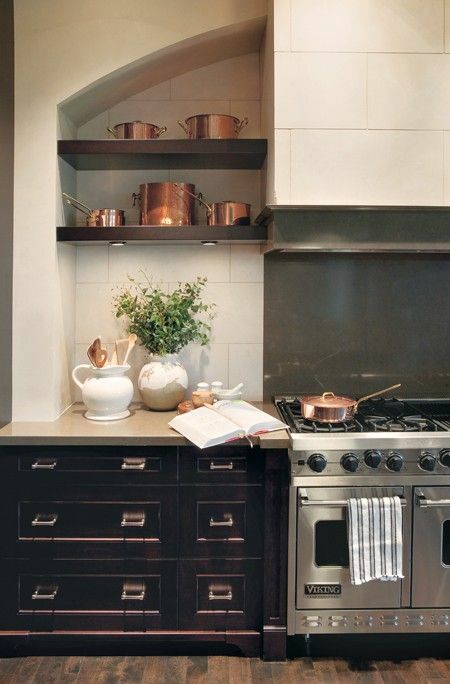 Hanging pots, spice shelves and a fabulous stove tucked away in a niche. I'm meeting the architect tomorrow for the first time and plan to show him these examples. I can't wait to hear his ideas! I agree these are stunning, ESP the last one. Problem I have with them is I am always chopping and plating by the stove and hard to get much counter space when you have niches. I always have a large cutting board beside the stove so I can just drop veg into the pan instead of carrying it over from the island. I wanted one too but just not the way I cook. I, too, like niche stoves. They just feel "right" and I think that is because they emulate the look of a fireplace. After all, until just the last few generations (in America at least) almost all activities in the home were clustered around the hearth. Can't wait to follow along as you recreate Asti. 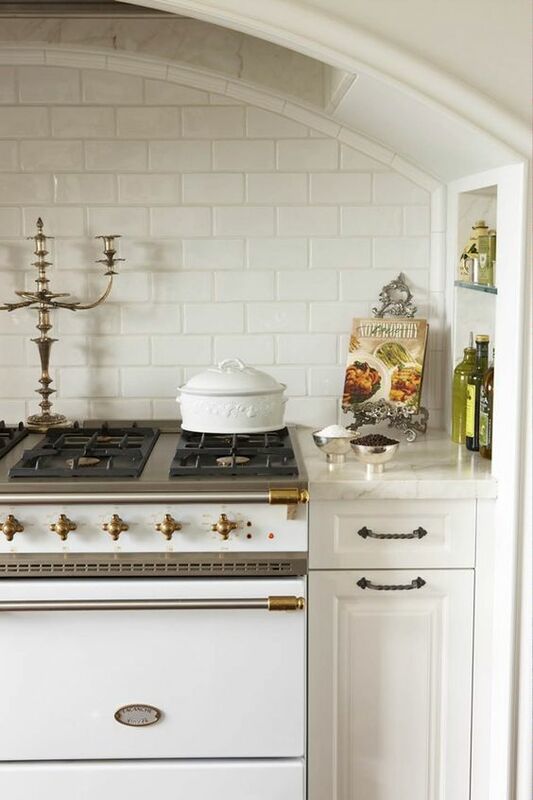 I love the look of a niche for the stove. As I recall the kitchen at Asti is large, so it should work into the plans. You are going to have a fun time. So exciting Delores! Can't wait to see what you do -your Asti house is already so gorgeous! And I agree, Brooke Giannetti's kitchen is beyond stunning. All the elements come together so perfectly! Sounds like someone is going to have some fun!! Can't stop being concerned for you and your neighbors in Asti. I pray you haven't lost anyone you love or care for. Please be safe dear one.